Come by to the Bay Area Sikhlens Film Festival on October 24! Come by to Mt. Pleasant High School to watch films targeting youth and families that will spread pride and love for Sikhi. Also, don’t miss out on the amazing Sikhs sharing their stories and talents. Youth Pride 10am–12pm: This features Sikh-centric films. Sikhs Around the World 1pm–2:30pm: Here, Sikhs will showcase their diverse talents. Kaur Voices 2:45pm–4:30pm: Empowered Sikh women will share their stories. Making a Difference 4:45pm–6pm: Here, fellow-Sikhs discuss having an impact. This event will be held on Saturday, October 24th at Mt. Pleasant High School. Pre-sale tickets end October 18 and are sold here. 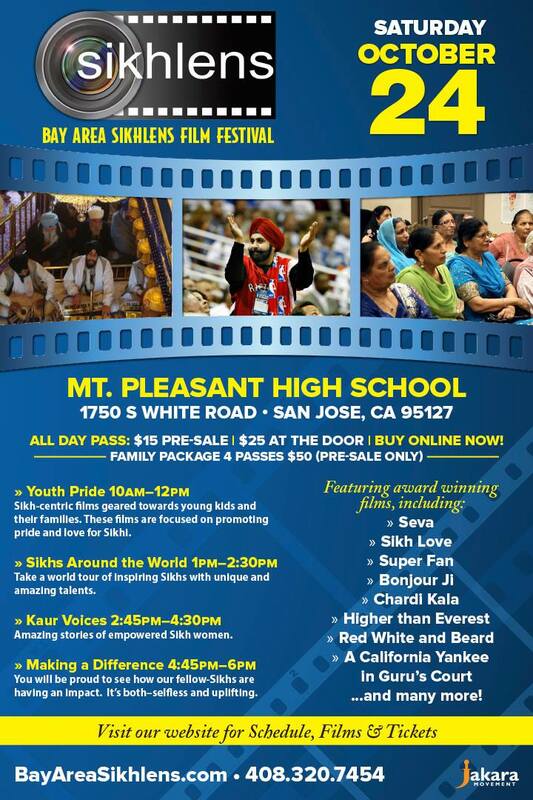 For more information, visit their Facebook page: Bay Area Sikhlens Film Festival and their website. October 18, 2015 in Uncategorized.